Although hybridoma cells are immortalized, extensive passage of hybridoma cells may cause mutations on antibody genes, and hybridomas may loss their specificity to produce the correct antibody. Therefore, sequence information of antibody is of extreme importance for stable quality of antibody in large-scale industrial manufacturing. To solve this problem, MtoZ Biolabs has developed a PCR based antibody sequencing workflow, coupled with degenerate primer design. 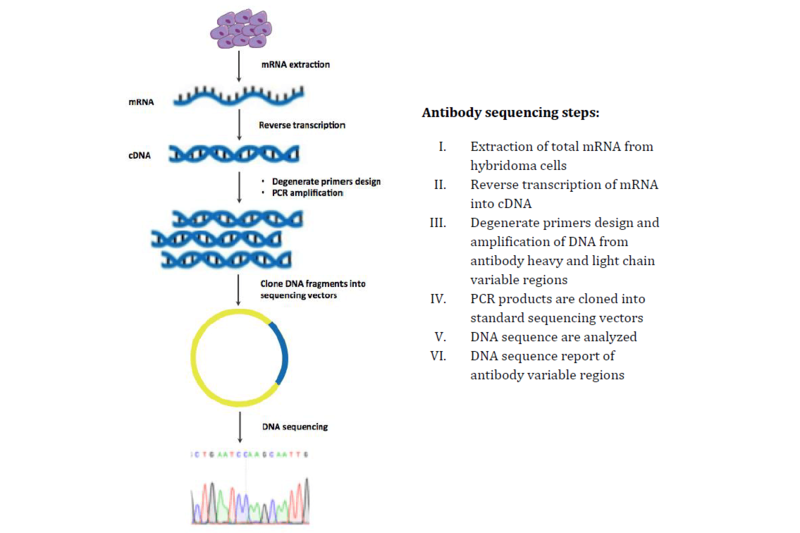 Compared with the mass spectrometry-based antibody sequencing method, this PCR-based antibody sequencing method is much more cost effective and less time consuming. In this method, degenerate FR1 primers are designed for PCR amplification of immunoglobulin (Ig) light and heavy chain variable regions from your hybridoma extracted mRNA. To better meet your research needs, we provide a full-package service, covering the whole analytical steps involving antibody sequencing. You can simply send us your hybridoma cells, and we will perform all the following analytical experiments.